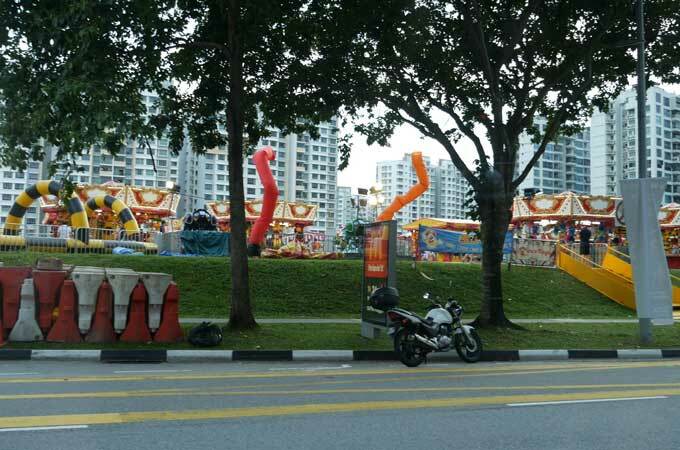 Much anticipated Uncle Ringo carnival or more affectionately known as fun fairs or “tikam”- is finally here at Punggol. 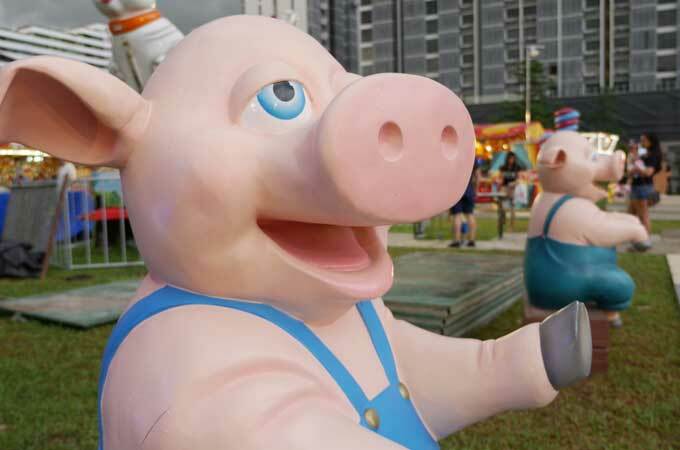 Located right at the open fields opposite Waterway point or nearest Exit D from Punggol Mrt is where fun beckons. Let’s go! 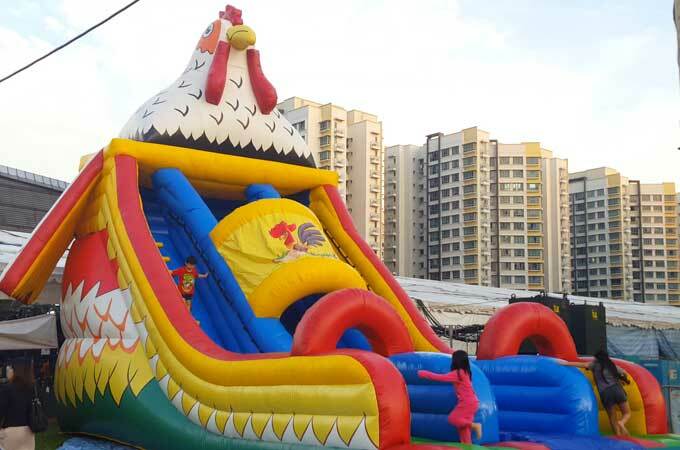 Arriving from the food bazaar entrance, you will be greeted by this giant rooster slide and the delightful squeals of joy from the kiddos. 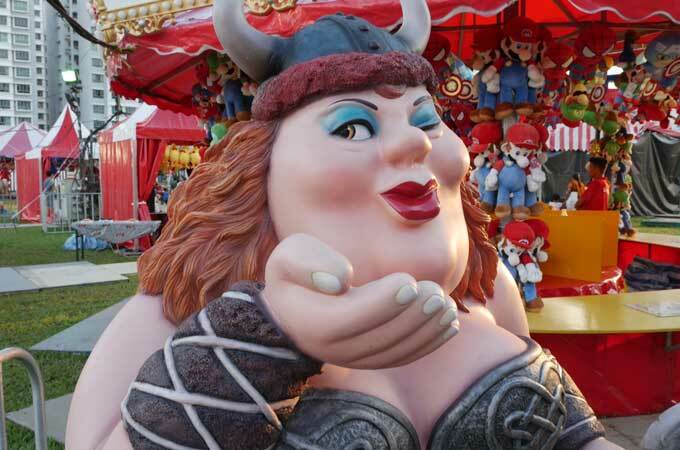 Alternatively, stroll along the road till you see two air dancers waving furiously to get your attention. 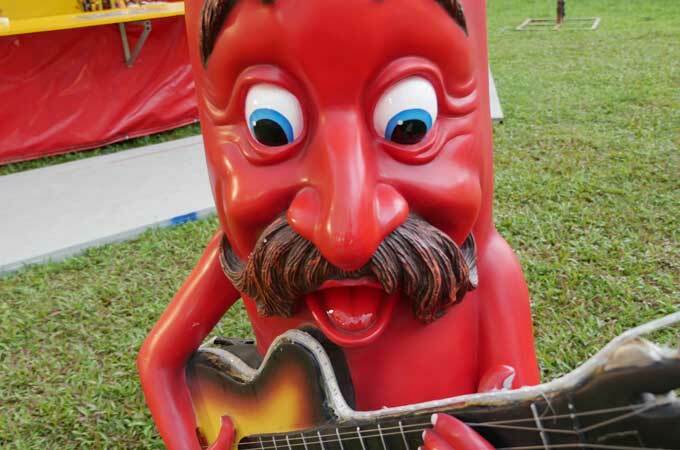 Buy and top up your Uncle Ringo card here. They use a cashless system for your convenience. Just tap and play. 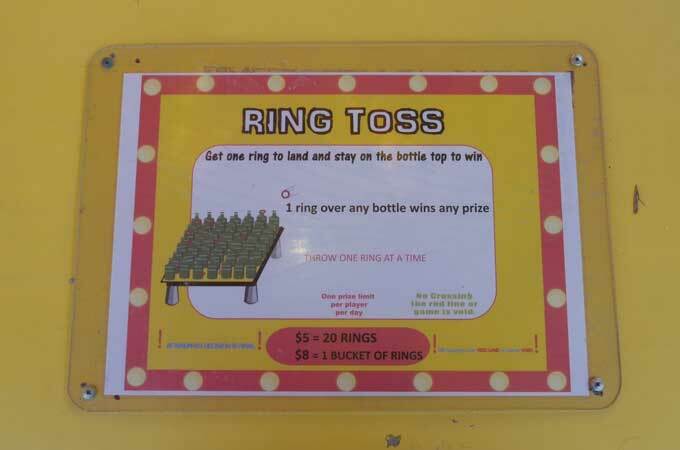 You can also top up the card at the self service kiosk located in a red marquee near the game stalls. 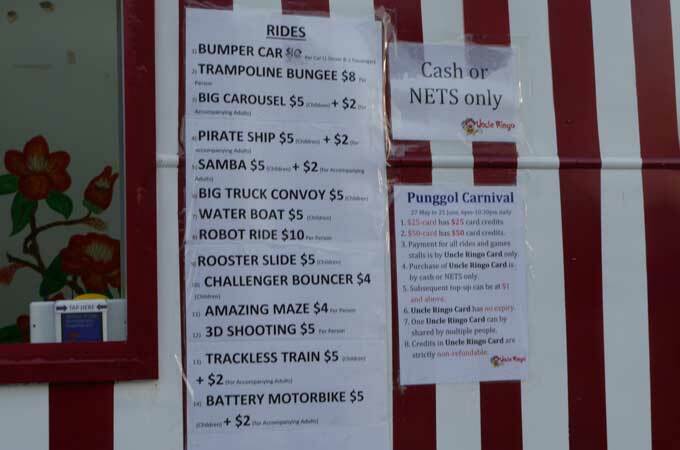 The rides available are bumper cars, trampoline bungee, big carousel, pirate ship, samba, big truck convoy, water boat, robot rides aka robot wars, rooster slides, challenger bouncer, amazing maze, 3D shooting, trackless train and battery motorbikes. 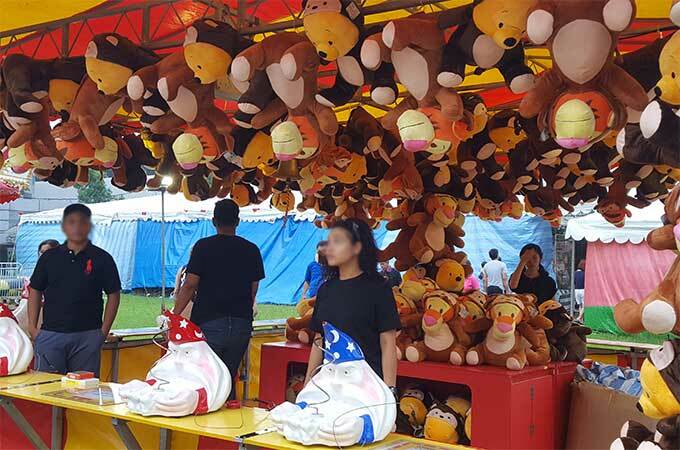 All games stall at $5. 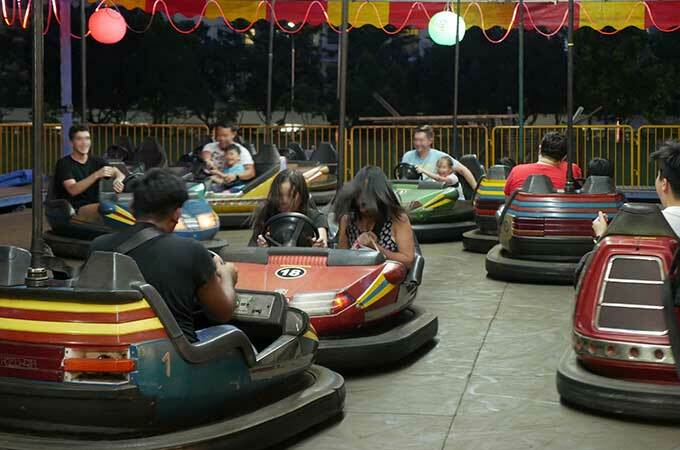 First stop is the classic bumper car rides. Bump your way around the arena or dodge as many cars as you can. You will see sparks fly literally above your heads. Bump to the beats of techno music and dance to the disco lights. 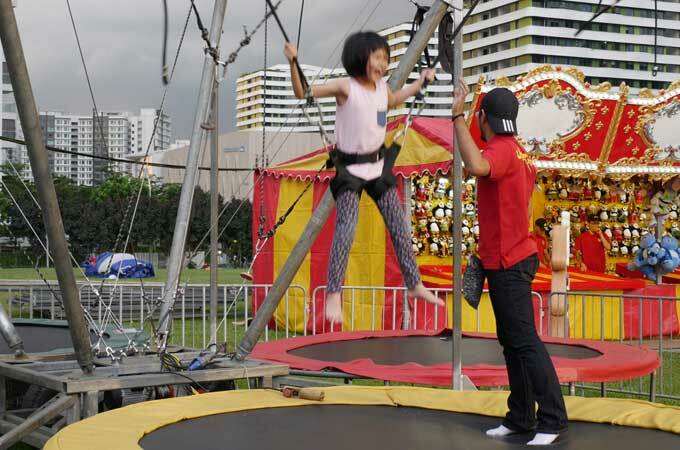 Trampoline bungee is popular among the kids. 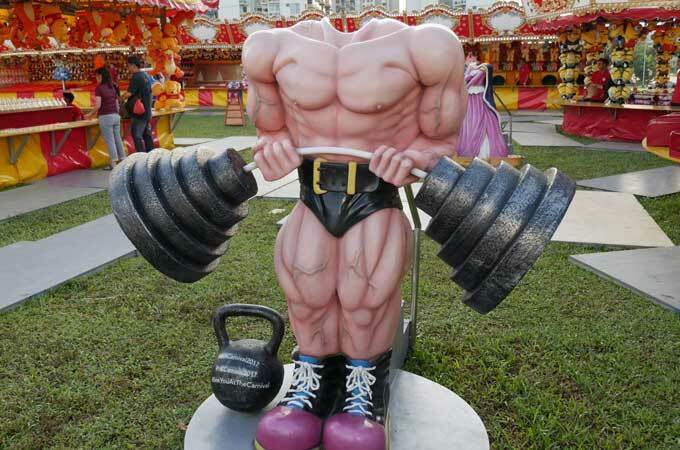 It promised to give you an instant adrenaline rush to your head. You will get strapped into a harness, safety checked and the crew will give you a gentle yank to get you started. Not long you will find yourself being catapulted into the air. 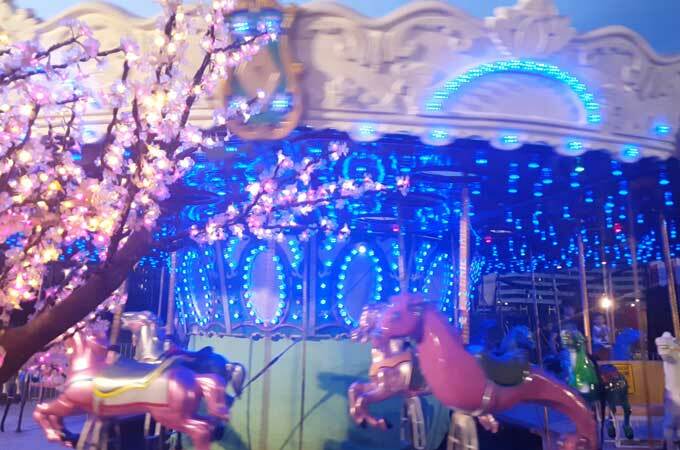 Big carousel ride is something not to be missed. 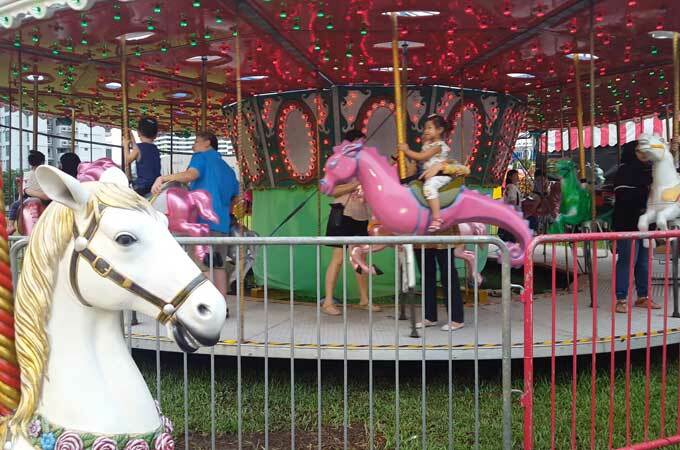 You get to ride ponies, horses and seahorses in shades of pearly pink, green, lilac, white and a big yellow seat for the largest person. How we wish there are unicorns too, that will be perfect. The big carousel transforms into a spinning arrays of ever changing colourful light when night falls. Magical, romantic or mysterious, you decide. This has to be the cutest pirate ship around. 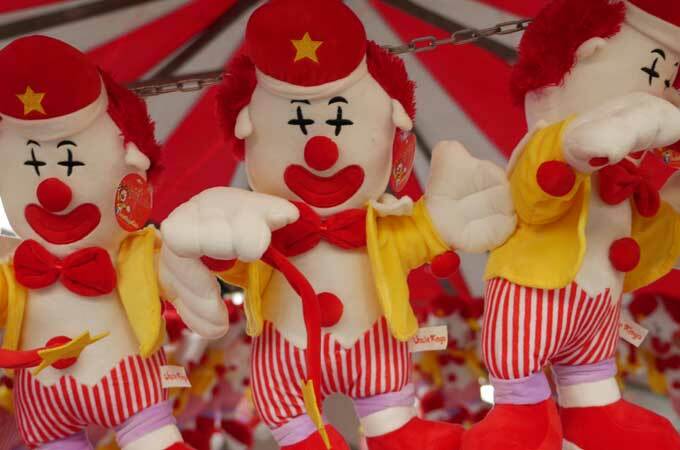 It will not bring you to great heights but will get you prepared for the real deal at Uncle Ringo upcoming fairs. 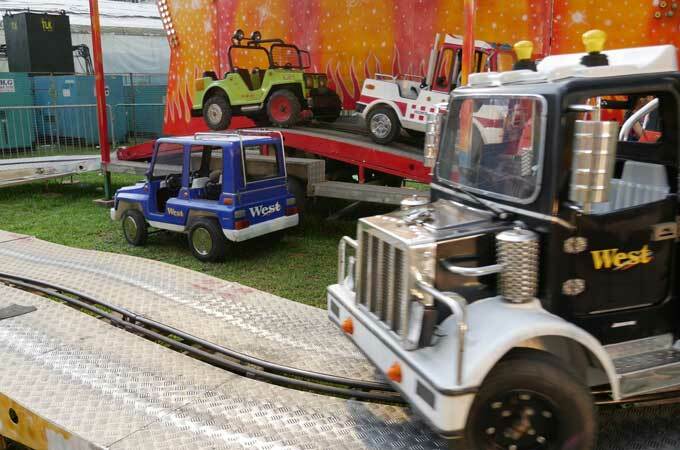 Big truck convoy runs on a track and needs no manoeuvring on the rider’s end. This black tractor reminds us of Rhino from the super toy archive series M.A.S.K except that this is in cool black instead of usual maroon shade. Robot wars (also call robot rides) are instant hits with the boys. You ride on it and control the movement from two joysticks that flank the high seat within. 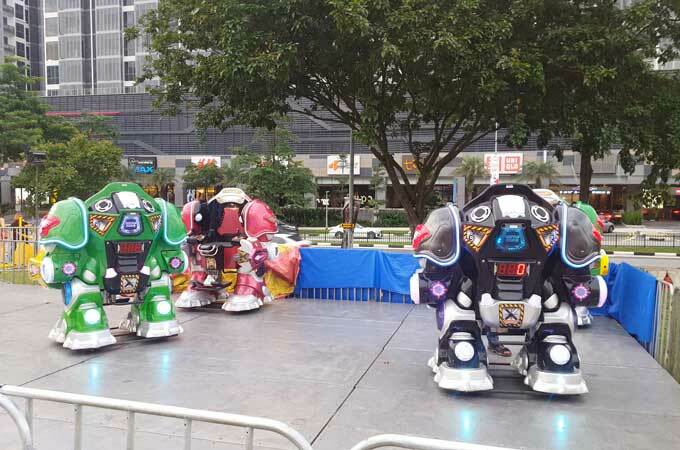 Engage your opponents’ robots with firing sound from the revolving arms. It will be awesome if they have water cannons to shoot the opponents. 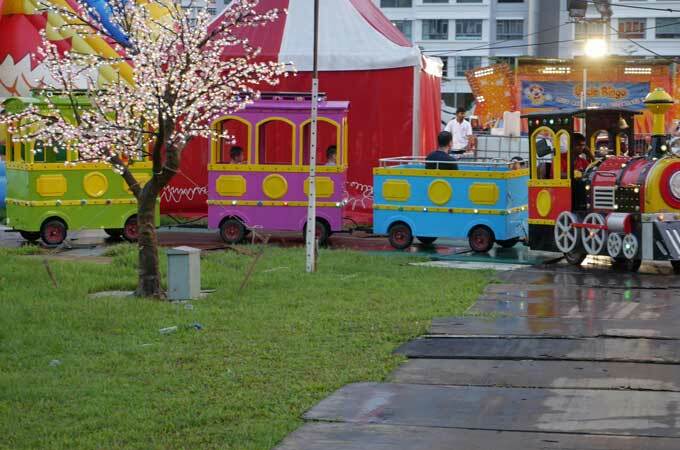 Trackless train is a real life experience of how it feels like to ride with Thomas and Friends. Hop on! Adults are welcomed too. When you’ve arrived at your station, the captain will sound the bell. 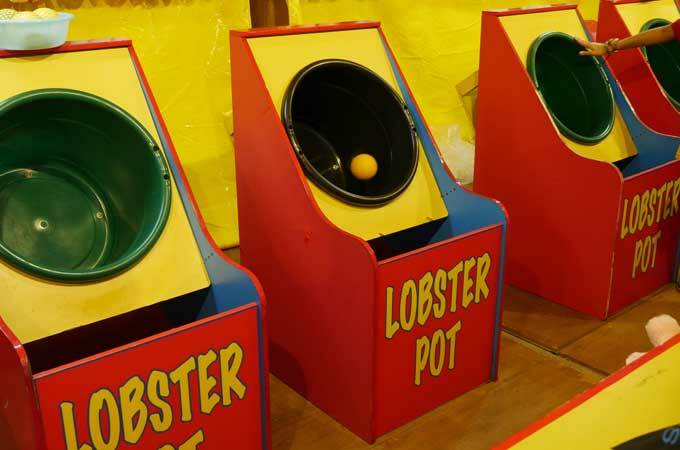 A visit to Uncle Ringo is not completed until you try your hands at their games. 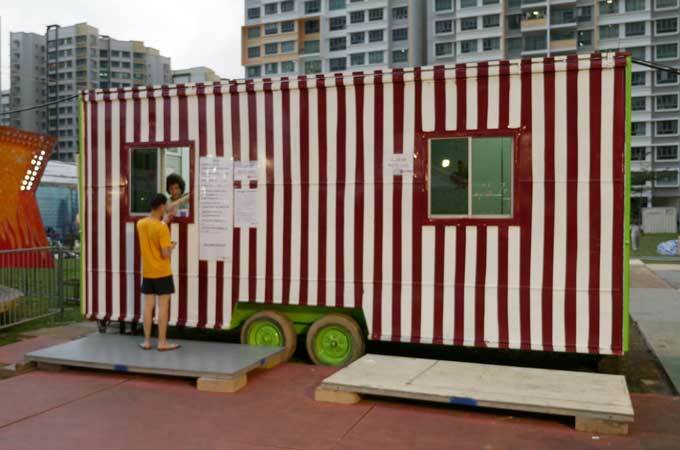 The game stalls are sheltered and walk decks are laid for the convenience of walkers and strollers. 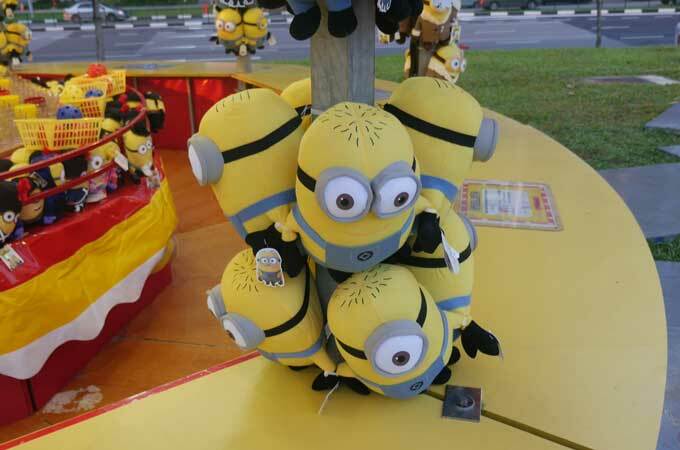 The prizes are displayed all over the game stall to entice you to play their games. 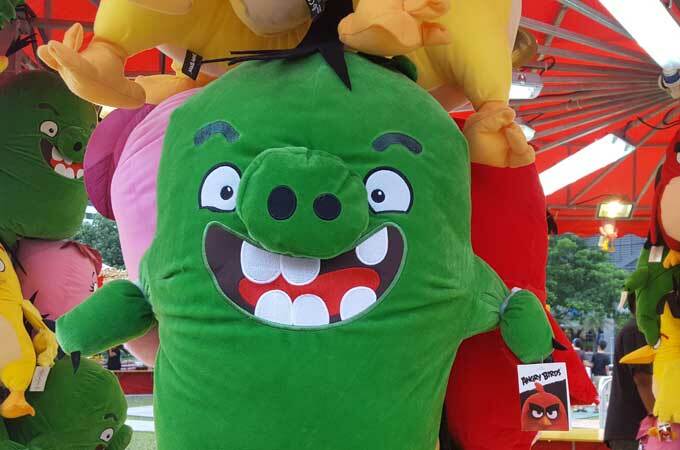 Choose from the angry birds’ series (Terence, Bomb, Chuck, Stella, Leonard) or the unicorn from Despicable Me 3 movie. 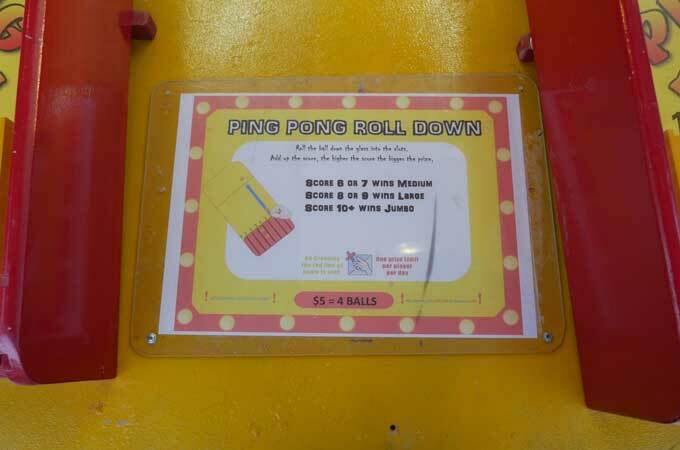 The strategy is to toss the ball underhand to create a backspin and aim the back of the rim. 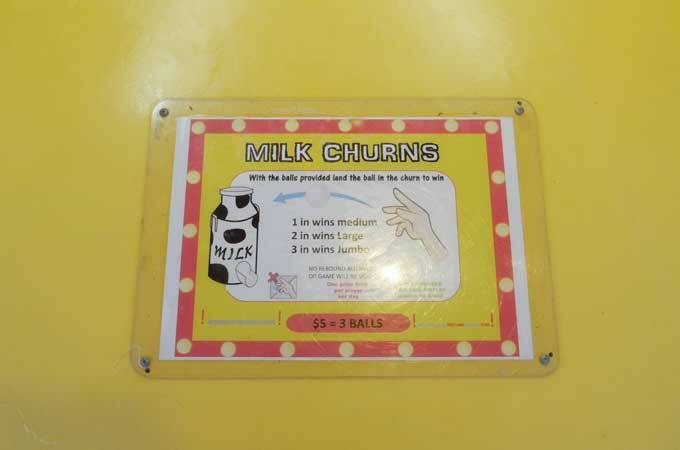 Throw any ball into the churn and you will get a prize. If you manage to throw all 3 balls in, you will get the biggest toy. 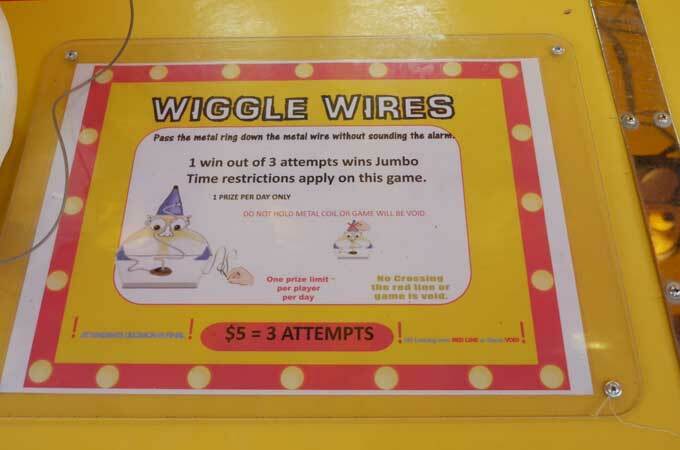 Thread the metal ring down the wire within the time limit without waking the wizard. 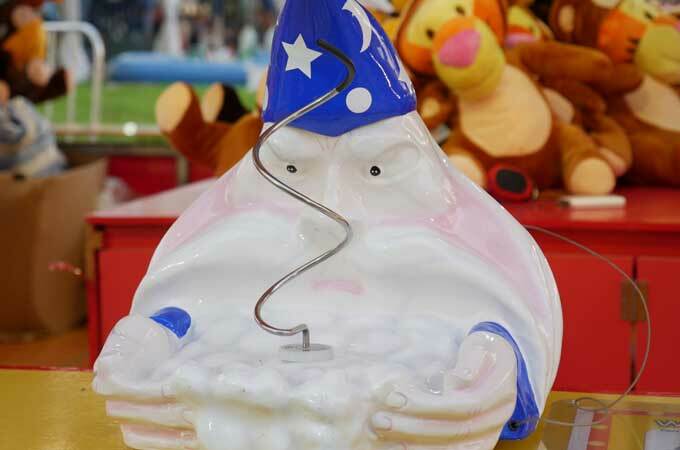 The wizard lets out a bleep sound if you touch the spinning thread. Winnie the Pooh bear and Tigger in cheeky monkey onesies. The strategy is to keep your elbow close to your body. This will prevent your arms from shaking too much. 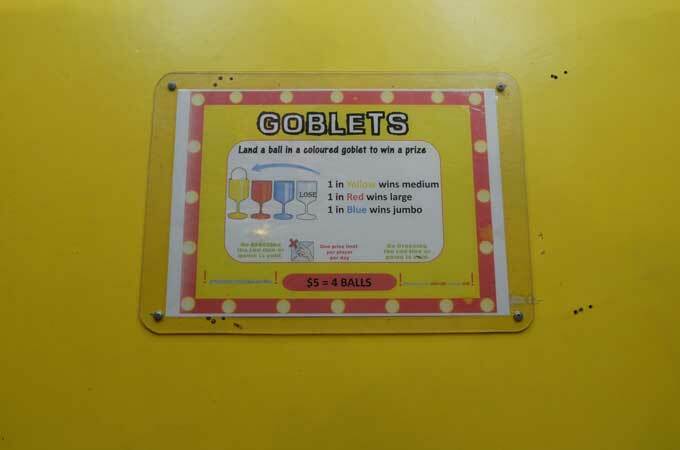 To win a prize in Goblets, you need to toss a ball and let it stays on any of the coloured cups. 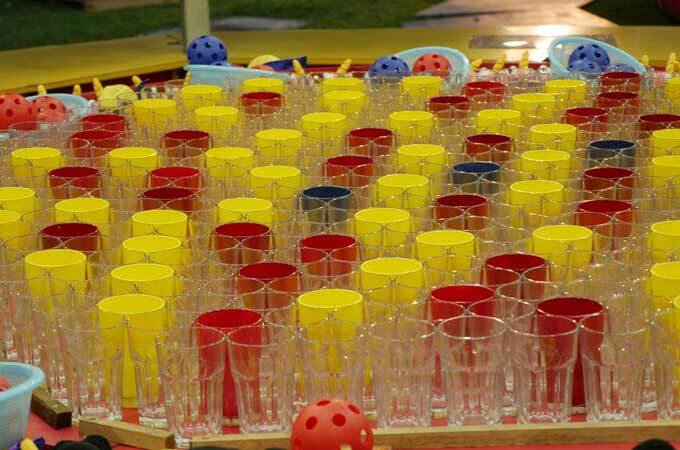 Aim the blue cups to win their jumbo toys. 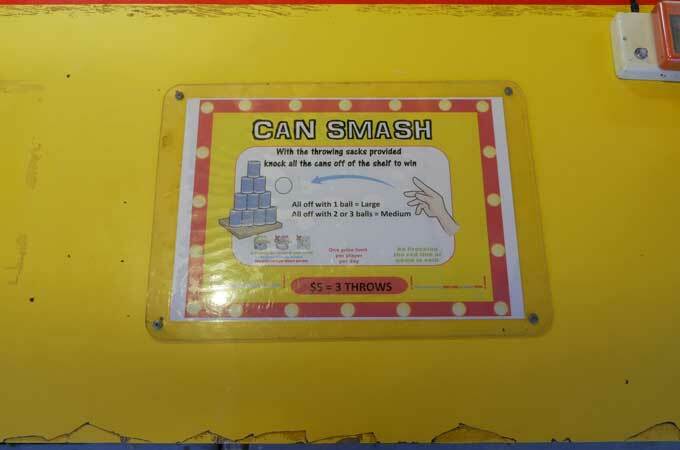 The strategy is to toss the ball gently and let it roll. 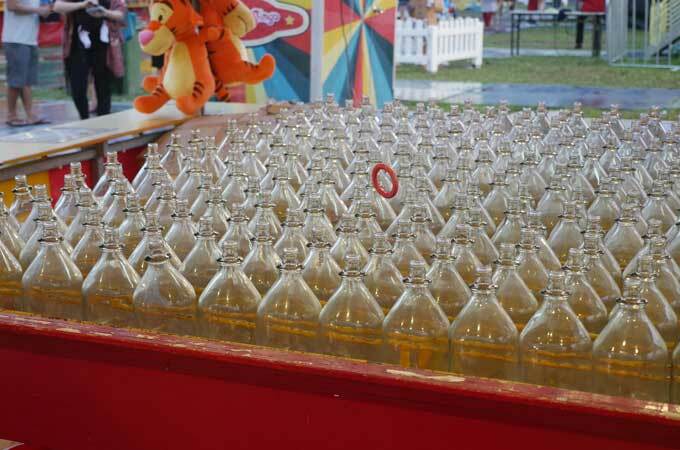 One ring over any bottle and you will win a prize. 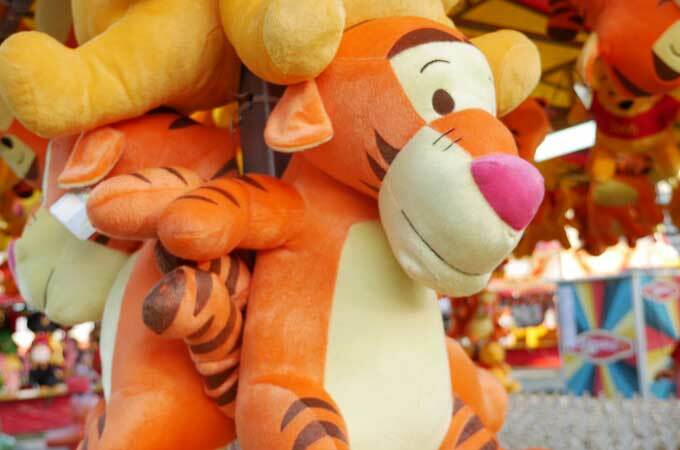 Win Winnie the Pooh bear and Tigger in ring toss. The strategy is to aim the bottles closer to you. Instead of throwing high up in the air, snap your wrist to get the most spin possible to stabilize the flying ring. The trick is how well you control your wrist. 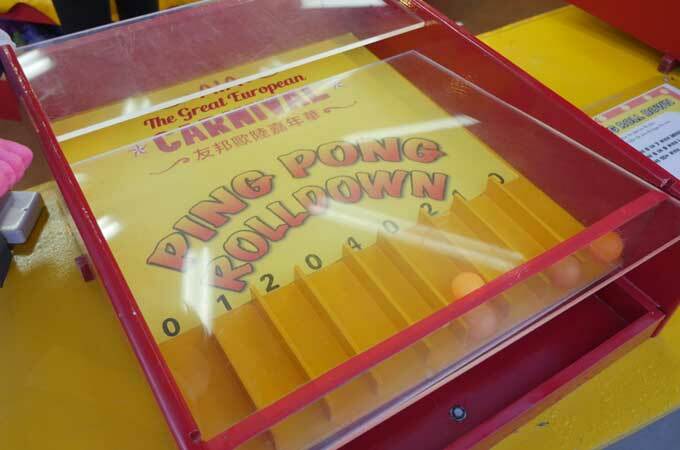 Roll the ball down into the slots and accumulate enough scores to get a prize. 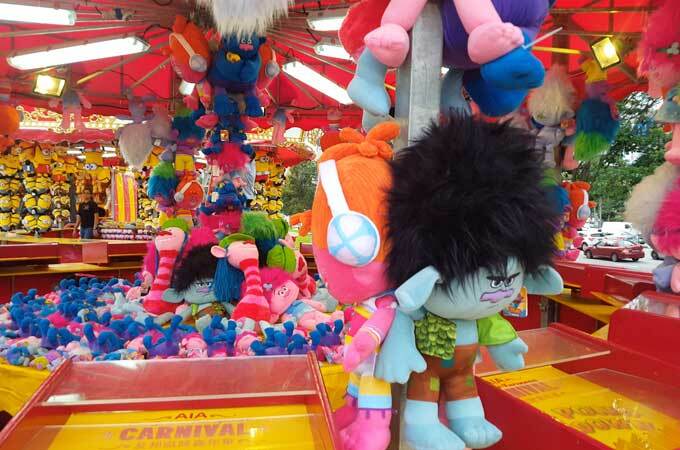 Choose from the Trolls (Poppy, Branch, Creek, DJ Suki, Biggie and Cooper) and bring home your rainbow of happiness. You will be spoilt for choice. The trick is let your first ping pong test how horizontal the board is. Sometimes when you aim the center, it will roll slightly to the right/left. Adjust accordingly for your next few tries. Knock all of the cans off the shelves with the sacks (3) provided and win a prize. Walt Disney’s Mickey Mouse and Minnie mouse. They come in matching outfits. Win a pair now! 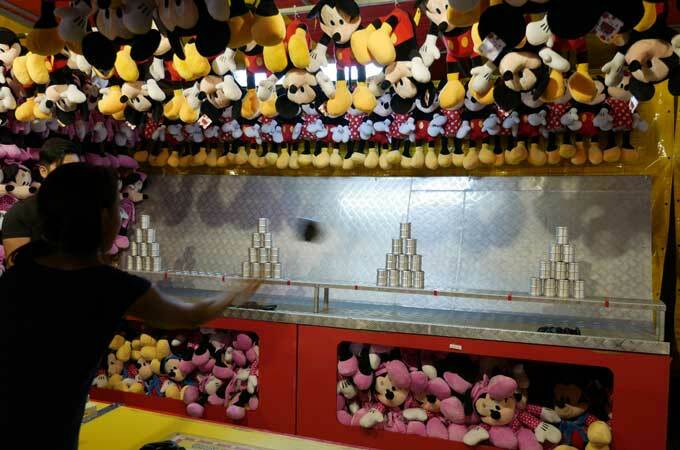 The trick is to aim the lowest row of cans from the side. 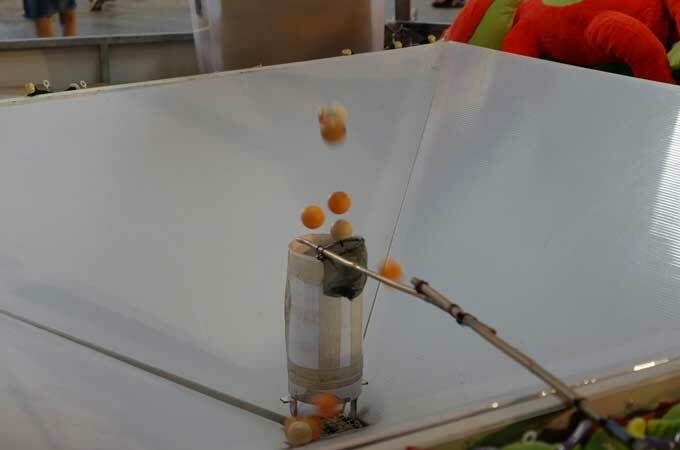 Never aim the center as you will be left with two single standing cans which are difficult to aim with your remaining balls. 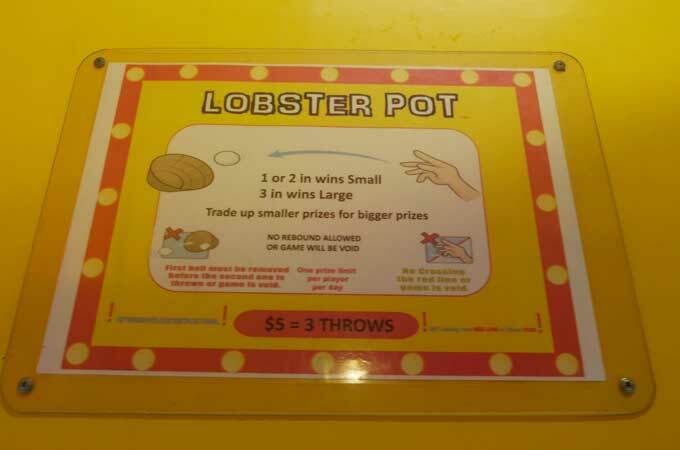 Get at least one ball to stay inside the pot to get your prize. 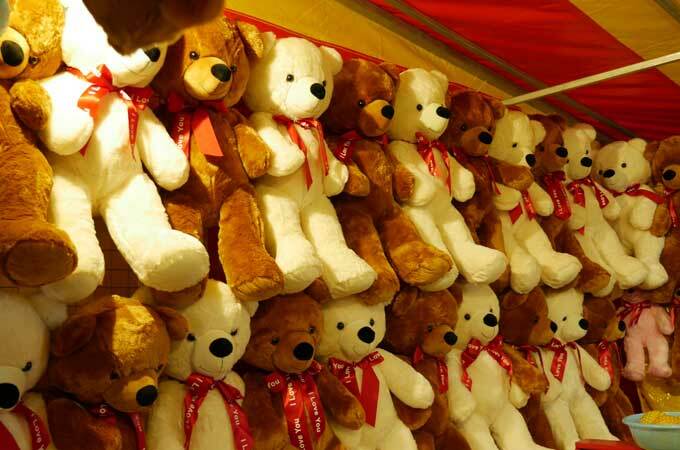 Classic brown bears, ivory bears, rosy bears and minty bears – which one do you fancy? Get as close to the basket as possible without crossing the red line. Gently toss the ball with some backspin. 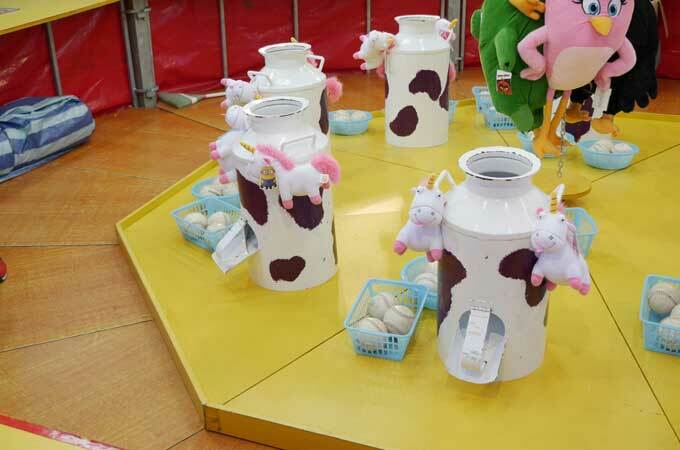 This toy is definitely a keeper and something you would want in your toys collections. 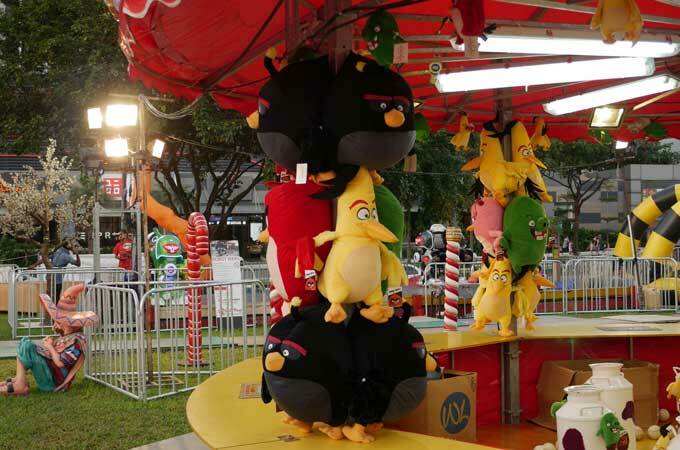 If you want to win the Uncle Ringo plush toy, look out for game stalls with Uncle Ringo as prizes. 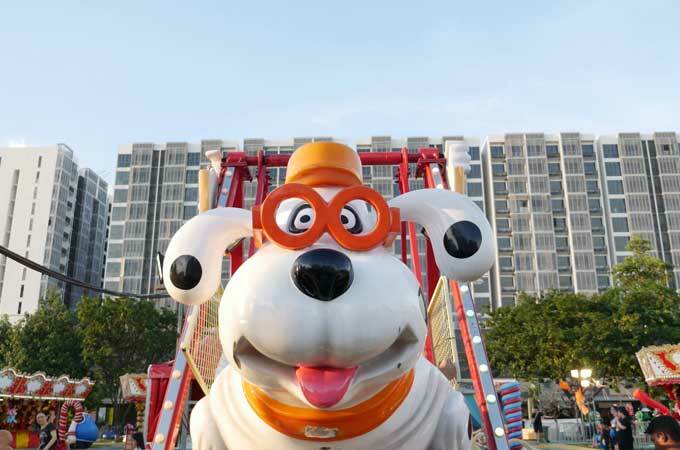 An example will be the Ping Pong Float. 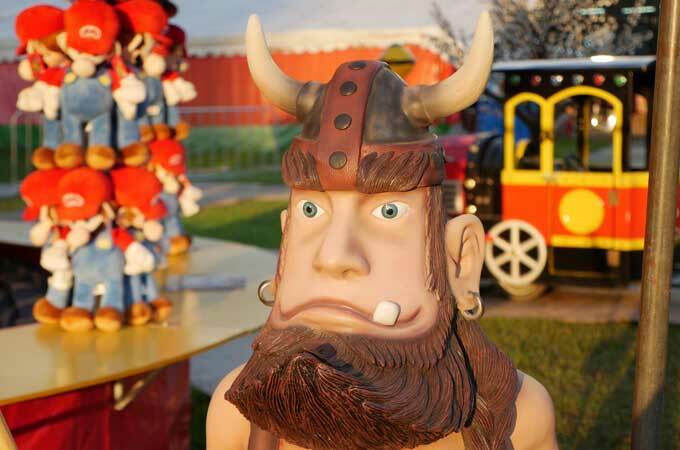 Besides the game stalls and fun rides, there are also plenty of instagram worthy pictures that you can take at Uncle Ringo. 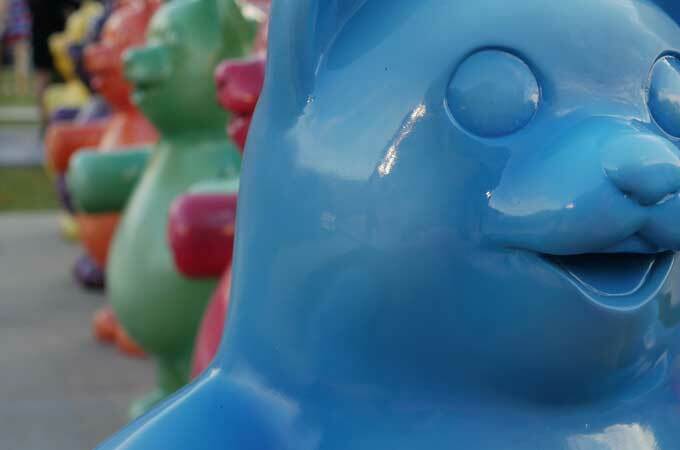 Gummy Bears – We dare you to take a bite out of it. 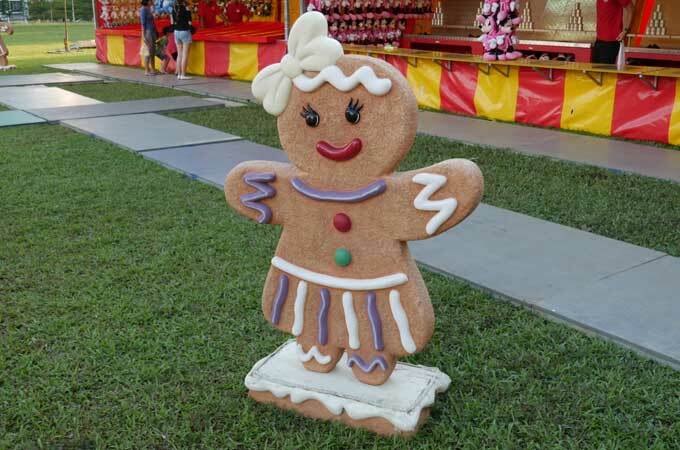 The ginger bread family you can hold hands with. Mexican is catching a wink. 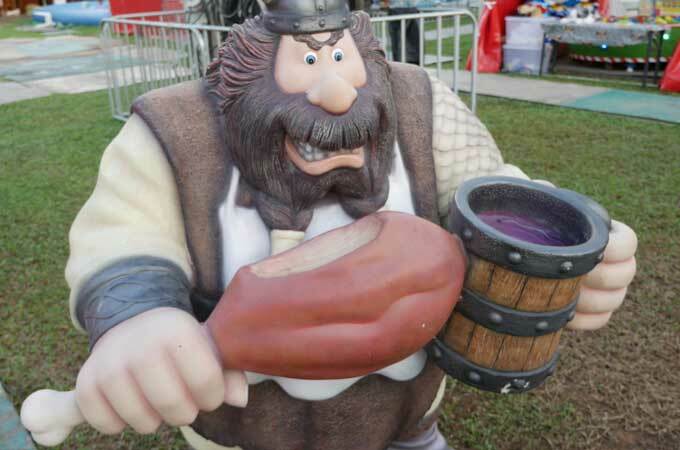 Vikings are feasting like there is no tomorrow. The way to getting a six pack effortlessly. 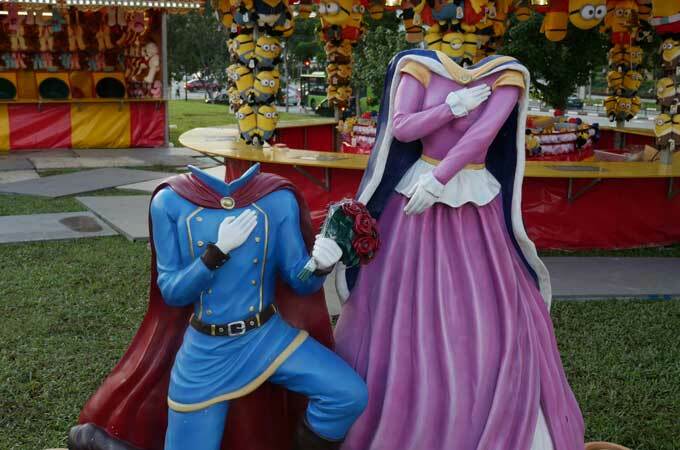 If you ever wish to pop the question to that special one, the props are here. Oh isn’t she sweet? Yes, she will blow you butterfly kisses. She came with her guards. Anyone need a back scratch or massage? Get it from the friendly pigs. Open till the 25 June 2017, daily from 6pm – 1030pm. Hurry up before it is gone. 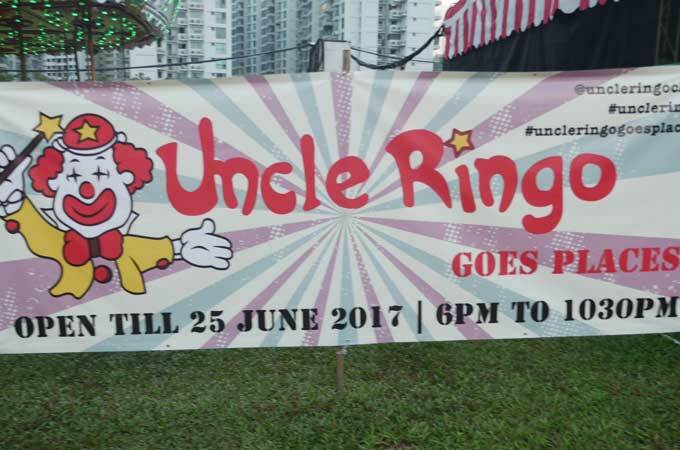 If you missed this punggol fair, fret not, you can follow Uncle Ringo at their facebook page or get your updates here. 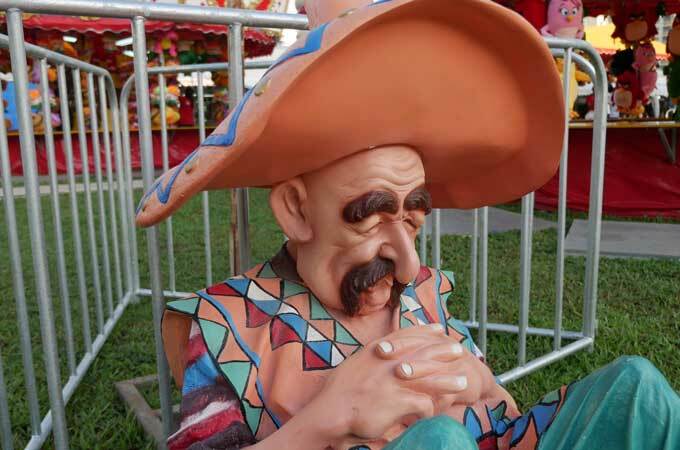 We are grateful that Uncle Ringo has kept our childhood memories alive and preserved the traditional way of us bonding with our family through fun and laughter by organising these carnivals throughout the years. 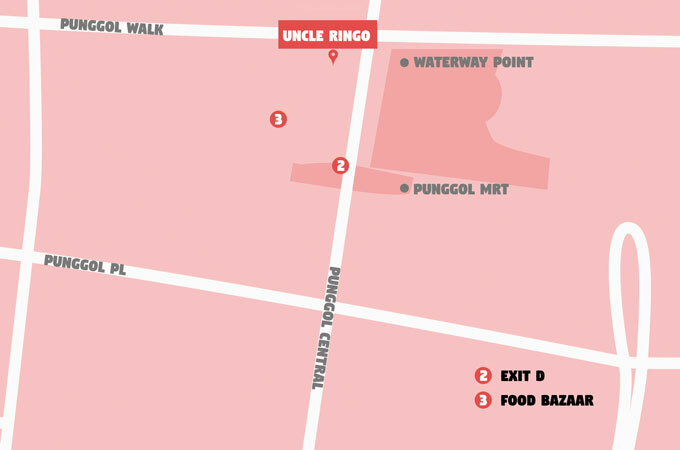 Bring your family and love ones to Uncle Ringo today!